A lot of vacation time can be spent not only in the parks, but also touring the different resort hotels that Disney has on property. The hotels are all themed and they are fun to explore. It’s good to know what your food options are while you are exploring. That way you can just grab a quick bite to eat and continue touring the resort. So, if you are wondering around the Epcot Resort/Boardwalk area you are now prepared with quick service location knowledge of the area. 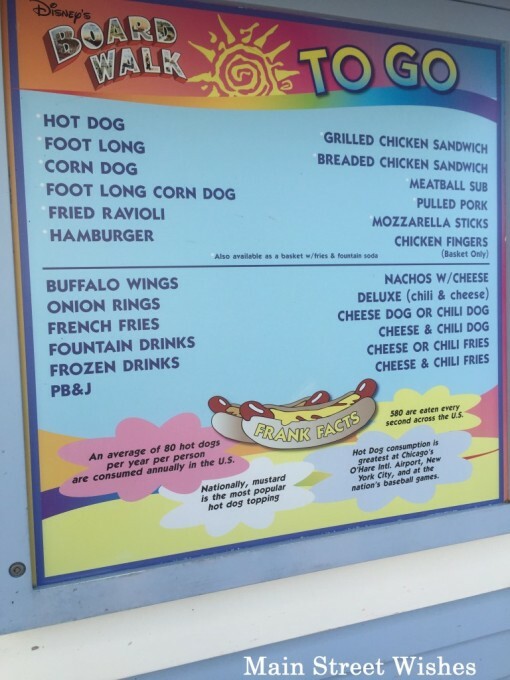 Or maybe seeing some of the menus will inspire you to take a side trip to the Boardwalk area. It’s a fun place to be, especially at night! Hope you find the list helpful!